US-Präsident George W. Bush, Romano Prodi, Präisdent der Europäischen Kommission, und José Maria Aznar, amtierender EU-Ratsvorsitzender, während des Washingtoner Gipfels im Mai 2002. September 11, European solidarity was repeatedly expressed and almost no doubts remained that the EU as well as the member states would staunchly cooperate with the US government in the fight against terrorism. The EU's reaction to the terrorist threat became manifested in different ways and resulted in specific measures. In addition to the broad agreement to support the coalition against terrorism and the corresponding statements, a Plan of Action was adopted by a special European Council on 21 September 2001, comprising diplomatic efforts, police and judicial cooperation, humanitarian aid, air transport security, economic and financial measures and emergency preparedness. However, the EU is not considered as a foreign policy heavy weight, and the United States demonstrated quite clearly that it is they that control and execute the fight against terrorism. Moreover, for the time being there seems to be no real need for the US to demand substantial European military support and the EU has no influence on the development of American foreign policy and Washington's choice of a unilateral approach. In early 2002, when US President George Bush expressed America's determination to extend the fight against terrorism on other countries ("axis of evil"), European criticism of American foreign policy became louder, but with only marginal effects. Are there any significant effects after September 11 on the EU's external relations towards third countries and regions? What are the consequences for the post-Nice debate and the further development of the foreign and security policy of an enlarging EU? The first part of the paper deals with the external dimension, by looking at the European policy towards selected third states and regions. The Middle East and North Africa are regions with which long-lasting forms of European cooperation and engagement can be found which are distinctively different in comparison to US foreign policy. The Balkans have become an area of tremendous EU involvement and a test case for European crisis prevention and crisis management capabilities. Relations with Russia are already a major aspect on the EU's foreign policy agenda, and will become even more important with respect to the enlargement of the EU. Shaping policies towards these regions cannot be done by neglecting the transatlantic dimension. Thus, the EU's external relations are to a large extent influenced by the quality and needs of the transatlantic link. Analysing EU foreign policy furthermore implies respecting the internal dynamics of the EU and the mechanisms that influence the decision-making process. Consequently, the second part of this paper explains the importance of reforming the EU's Common Foreign and Security Policy in a comprehensive way. But the consequences of September 11 cannot be reduced to the foreign and security political implications. Not least since the EU is on the verge of enlargement it is necessary to consider new actors and interests. And finally, there is even a lasting effect on the further development of the European integration process. The September 11 attacks have demonstrated the necessity of the long-term approach towards the Middle East and Euro-Mediterranean Partnership. With regard to the Israeli-Palestinian peace process there will be either a long-term management of the conflict by settlement, or break up altogether, with serious implications for regional security. After several months of benign neglect September 11 did convince the Bush administration that it ought to play a more active role in the conflict although it reduced at the same time its tolerance for what was perceived as Palestinian terrorism. However, the new envoy Anthony Zinni proved unable to bring the bloody war of attrition between Israelis and Palestinians to an end. Even worse, the cycle of violence and counter-violence ultimately culminated in a large campaign of the Israeli army that led, at least temporarily, to the re-occupation of most autonomous Palestinian areas in the West Bank. Instead of embarking on a risky strategy of military intervention in Iraq, the EU should move towards a swift implementation of and further evolution towards a regime where restrictions on - and delays to - Iraqi non-lethal imports are lifted. At the same time military controls must be kept in place, and some form of weapons of mass destruction monitoring needs to be re-established. Such a policy would also have a good chance of restoring some cohesion in the alliance, and of avoiding problems with, and within, friendly states in the region. The EU and the United States should agree on a common agenda for a "post-Saddam" era in Iraq, regardless of when it comes about. It would be a good idea to outline the conditions under which an Iraqi government could be reintegrated into the international community and receive the support required for the reconstruction of its infrastructure. Concerning the Southern Mediterranean countries the EU should embark on a pragmatic dialogue on terrorism with its partner countries while adopting a higher profile on issues of democracy and human rights. To the countries having signed association agreements the EU should offer to enter into a comprehensive policy dialogue aimed at creating a "Mediterranean tiger" - as a role model of successful development. These "association partnerships" will eventually lead to a type of relationship somewhere between a mere association and a full-fledged EU membership. At first glimpse one could be tempted to ask whether the recent successes of the European Balkan strategy combining crisis management and military presence with reconstruction and reform assistance might serve as a model for a post-Taliban Afghanistan. A "Balkan model" or a "stability pact for Afghanistan," however, might be a fallacy. The promise of a (long-term) perspective of EU accession gives the states and nations of the Balkans a common objective they never had before. It also gives Brussels the leverage needed to push and guide unpopular reform processes and to stimulate economic development and political democratisation in the framework of the Stabilisation and Association Process. Despite the virulence of the ethnic and territorial conflicts in the Balkans, state sovereignty is and remains the highest goal. Conversely, for at least the past twenty years Afghanistan has not seen any ruler seriously concerned with any sovereignty based on more than military force and control over strategic locations. The key premises of European stabilisation policies for the Balkans are missing in the case of Afghanistan. Whereas the Balkan model may not be transferable, the key lesson learnt in that region over the past ten years, however, may remain valid. Without an equally substantial and determined program of humanitarian aid, economic reconstruction and political stabilisation, no military intervention - no matter how massive - can produce long-term stability and security. The political will and stamina of the international community to stimulate and guide processes of stabilisation and sustainable development for years and decades on end will be decisive. During the war in Afghanistan, the USA and its European allies agreed on a combination of military power and humanitarian aid. In the implementation of the Bonn Agreement, the diverging American and European philosophies of stabilisation and modernisation as well as the balancing of hard and soft power projection are bound to reappear. In the aftermath of the bombing, the US aversion against peace-keeping missions and comprehensive post-conflict strategies already reappeared. These policy preferences are reminiscent of Balkan exit strategies and a division of labour between US warfare and European post-war reconstruction. The crucial question remains to what extent the consequences of September 11 will go further toward impulses to strengthen integration and co-operation between East and West than single-issue short-term action. The current situation can be best described as a window of opportunity: If Russia continues its policy of becoming a modern European country, the EU will be facing the challenge of its growing importance. Future developments depend on Russia's strategic choice of further modernisation and the EU's capacity and capability to be a security and defence actor in the international arena. The European Union and its member states fulfil several conditions for a modernisation partnership. The EU is customer number one for Russian exports, and with about 40 percent amount of foreign direct investment, the EU member states are the biggest direct investors in Russia. The Union is also the largest provider of technical assistance to Russia. Furthermore, supporting the Central and East European candidates states through the combination of impending membership and rule-setting for internal development from the outside is a unique success story for stabilising transition processes. If Russia is setting new goals for its transition, the Union should use these experiences to stabilise internal Russian developments. Potentially, the EU policies of the technical assistance program TACIS and the humanitarian aid office ECHO can be adopted to the additional requirements. A clear concept of designing a common European economic area is still missing, but nevertheless extending security related co-operation towards a widespread partnership might be a fresh impulse. Taking into consideration requirements of Russian modernisation, the economic relationship should go beyond energy exports from Russia to Europe. The deep impact the events of September 11 have left on the United States and on the American view of the world is shaping transatlantic relations. Those partners and institutions that are of relevance or of support in the current challenges will be at the center of US perception of this relationship. Those who remain indifferent or become cause for concern will move to the margins of the relationship - to say the least. A new transatlantic agenda addressing the issues of the 21st Century is needed with long-term commitments from both sides of the Atlantic and a strong political will to implement this agenda. When acting together, the US and Europe need deeper relations than exist today. Windows of opportunity could be found in many issues: as the following list may show: Greater transparency, closer cooperation, and the sharing of intelligence ; a conclusive security strategy; adequate burden sharing focusing on output-goals; effective means of cooperation between ESDP and NATO; ongoing common support for the stabilization of South Central Europe; re-engagement in the Middle East Peace Process; a common strategic approach to the second round of NATO enlargement. Europe requires the attention and the normative power of American foreign policy. America needs the resources of the European economic power in order to flank its peace and security order - not just in the Middle East and in Africa but also in trouble spots in Asia and Latin America. To this end, Europe must be more strongly involved in negotiations on political settlements. Developing solutions to global challenges - be it the environment, migration or social and ethnic conflicts - is not about preserving the power of security policy. Anyone who wants to make a real contribution requires partners and coalitions. Together, Europe and the United States represent the ideal critical mass. Should the transatlantic partnership weaken, rivals of the West could play America and Europe off against one another, manipulating global competition between economic blocs. At a time when East Asia is unfolding its economic and demographic potential, such transatlantic rivalry would be damaging to both partners. 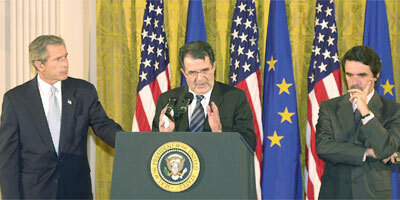 The EU has realised that security policy will have to follow a comprehensive concept - September 11 has underlined that. A look at the non-military capabilities of EU external relations offers a broad range of instruments and policies available. However, what is still lacking is a strategic vision of the EU's foreign policy. Article 11 of the Treaty on European Union defines the objectives of CFSP without reflecting a clear geopolitical thinking. The geographic extension of CFSP/ESDP needs to be clarified, which means to define whether the significance of this policy will be mainly concentrated on the enlarged EU's closer neighbourhood or whether it is a policy with a global outreach. CFSP/ESDP cannot be sufficiently developed without finding a satisfactory solution for how to improve the decision-making process. By offering a flexible instrument for accommodating the interests of pro-integrationist member states, enhanced co-operation can diminish the negative effects of possible blockages of classical decision-making procedures in an enlarged EU. Furthermore, effective decision-making and common external action may be increasingly difficult to achieve without moves towards at least the partial communitarization of CFSP. Attempts to further communitarize CFSP must exclude the sensitive field of military affairs, to which the current and future member states attribute the high value of national sovereignty. Military crisis management as one branch of the EU's Security and Defence Policy must not be linked with the term 'communitarization'. Instead, matters of joint concern in the military sphere of ESDP should - for the time being - continue to be handled by means of intergovernmentalism. On the other hand, the traditional civilian aspects of the EU's foreign policy, including non-military crisis management should be brought closer to the Community method as the resources necessary to implement them are to be found mainly in the area of today's Community competences. Institutional developments alone will not suffice to enhance the EU's role as a holistic international security actor. The Union will need to further develop its operational assets and capabilities. It is in this respect that the current and future member states of the EU will have to further intensify their efforts, streamline their overall military structures and increase both their national defence budgets and developmental aid spending if they want to live up to their own expectations. Security in a comprehensive understanding implies, furthermore, that CFSP/ESDP cannot be limited to one pillar of the European treaty framework. On the contrary, there is a necessity for an overarching approach - which was further underlined following September 11 when Justice and Home Affairs became a central topic in the security debate. To close the gap between "common" and "intergovernmental" would thus imply the harmonisation of conflicting policy fields for a common interest. This will also touch those policy fields still located in the third pillar. Similar to the case of CFSP, the distinct pillar containing the remaining aspects of cooperation of police and justice will in the end have to be abolished subsequently. However, if the EU is about to tackle the trans-border consequences of the freedom of movement in the common market, a full legislative participation of the European Parliament and a democratic scrutiny of executive actions should be guaranteed. The fight against terrorism must not weaken our basic values and rights. Thus, the democratic and understandable realization of an area of freedom, security and justice will be one task for the convention and the 2004 intergovernmental conference. The necessity to adequately react to the challenges of international terrorism should not hamper developments of major European projects such as enlargement. On the contrary, the process should rather gain momentum than come to a halt. September 11 and its aftermath did not negatively affect the enlargement process. One cannot yet assess the impact of the fight against international terrorism on subsequent second or third rounds of enlargement. However, as the details of a next round of EU widening will become evident at the end of 2002 or early 2003, there will be a need to agree on a coherent and binding enlargement strategy. The adoption of a quickly developing acquis on internal security constitutes a major challenge for the candidates' already stretched police and judicial systems. The accession countries will have to strengthen their border-control efforts, share intelligence and information and increase their state capacity to track the movement of persons. The EU will have to help in developing institutional capacities and prove practical assistance, both human and financial. The fight against international terrorism requires to improve coherence and co-ordination between the EU's external and internal security concerns. To achieve this, the Union should take into account the neighbourhood aspects of existing border regimes, visa and immigration policies when designing, implementing and revising common strategies on its direct neighbourhood in Eastern and South-Eastern Europe. Proposals on legislation in the area of Justice and Home Affairs should contain a "neighbourhood impact assessment" that considers the specific exposure of the accession countries and/or future new member states. In an attempt to strengthen border controls on the enlarged EU's new eastern borders, thought should be given to the idea to establish a European Border Guard, consisting of border guards from all member states who are specially trained to serve in joint missions. Such a European Border Guard needs to be based on the principles of equal partnership and reciprocity among new and old member states. With the fusion of the Single Market and the Schengen zone, there is a rationale to create a European Customs Service composed of customs officers from all member states. Through a joint institution, member states could share the financial burdens (and revenues), exercise a joint control and thus develop mutual confidence. The reform of the European Union is linked to long-term projects. The effect of September 11 in the areas in question can only be to exert additional pressure to take action and to provide just one more argument for the necessity of efficient and democratically legitimated decision-making procedures. After decades of focusing on economic objectives, the EU, today, is more and more measured by its performance in basic duties of the state such as the guarantee of interior and exterior security, the realization of personal freedom, general prosperity and appropriate social conditions. The fact that these challenges had already been tackled before September 11 illustrates the magnitude of the ambitious integration projects initiated by the member states and the common institutions over the past few years. What September 11 meant for the reform of the political system of the EU can be described as an additional impetus for integration. Impetus or blockade for the EU reform process?